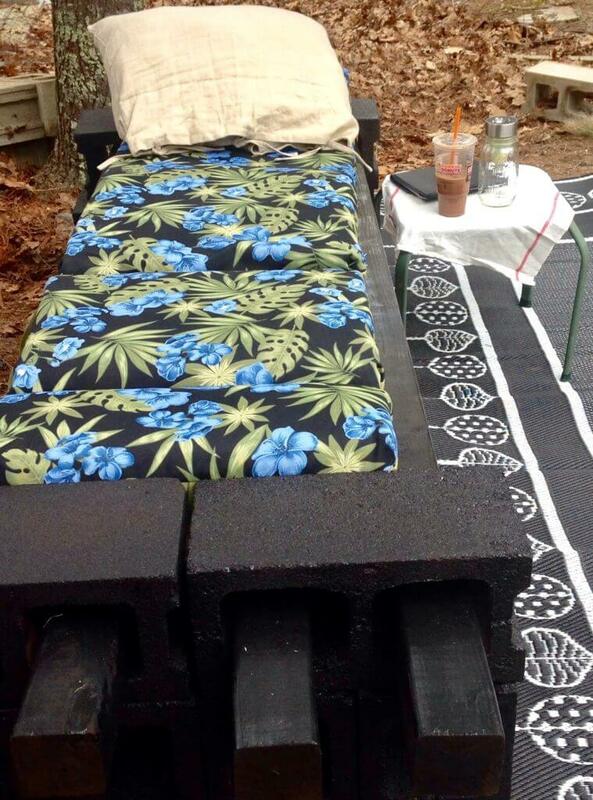 Cinder blocks aren’t just for heavy-duty construction. 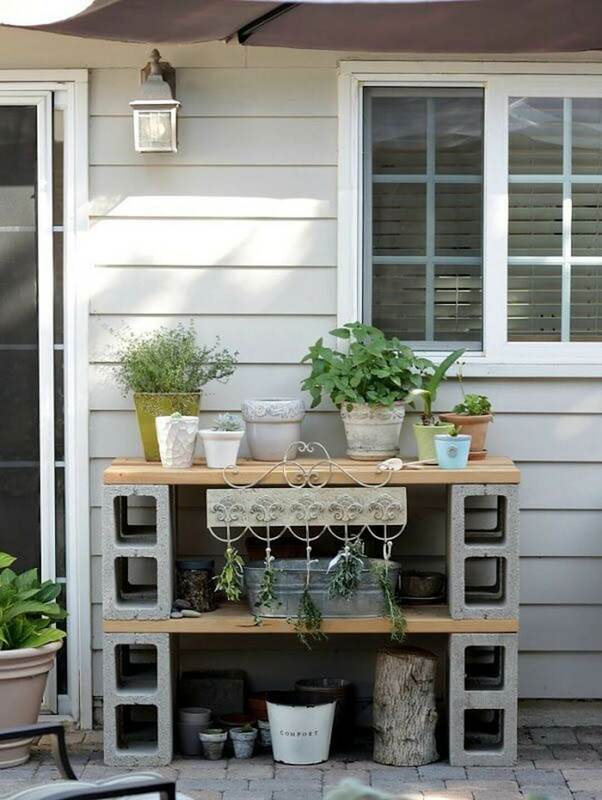 These days, people are thinking outside the box and getting creative by using cinder blocks for various projects that are unique, fun and functional. From indoor and outdoor furniture to garden planters and décor, you can use cinder blocks for so many home improvement projects. Think of them as Legos for adults. Cinder blocks are perfect when it comes to outdoor projects since they are very durable and weather resistant. In addition, they are very affordable materials to use for building. Cinder blocks also fit well with essentially any design style. The combination of natural materials like the concrete blocks paired with wood or metals are an on-trend design concept to incorporate throughout your homestead. With a little creativity and inspiration, you can create stylish pieces of furniture to place either inside or outside the home as well as beautiful planters to showcase your favorite flowers or succulents. Build an outdoor stove, shelf, table, bench or whatever else you’d like to make with them. The possibilities are endless. The next time you’re at your local hardware store, grab some cinder blocks and try out one of these creative outdoor projects with cinder blocks. Happy Creating! Warmer weather means lots of outdoor fun for the whole family. 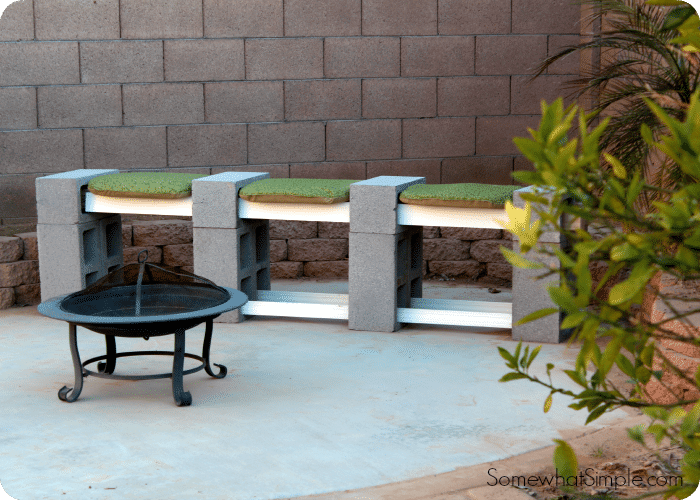 This custom cinder block patio bench provides extra seating whether you are hosting family gatherings or just sitting around the fire. The great thing about using cinder blocks for this project is that you can make the bench as long or as short as you’d like. Add a few cushions from unused chairs and you have a comfortable bench ready for entertaining. 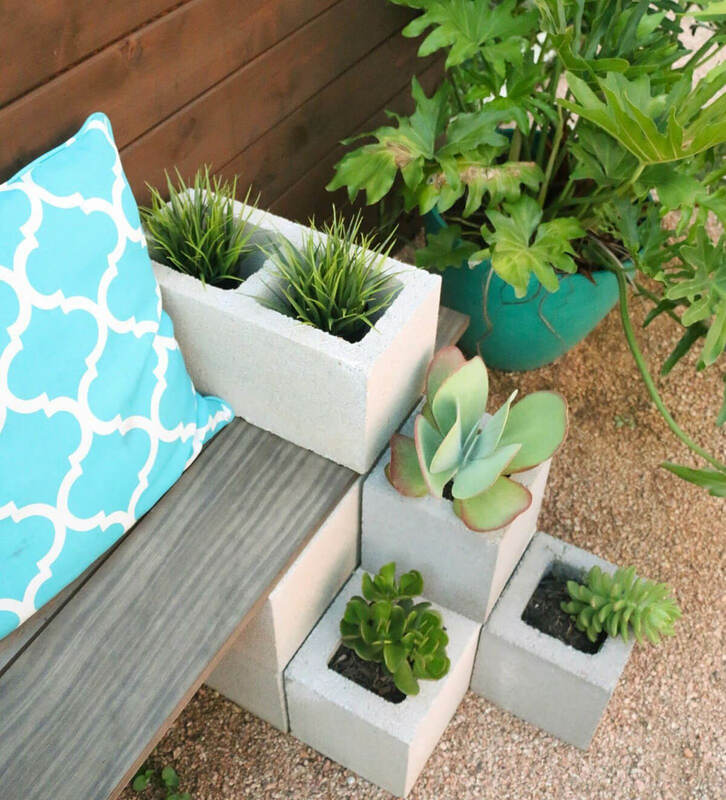 Take your bench seating to new heights by adding a few planters to your cinder block bench. I love how you can place the cinder blocks in a variety of directions for added height and dimension. 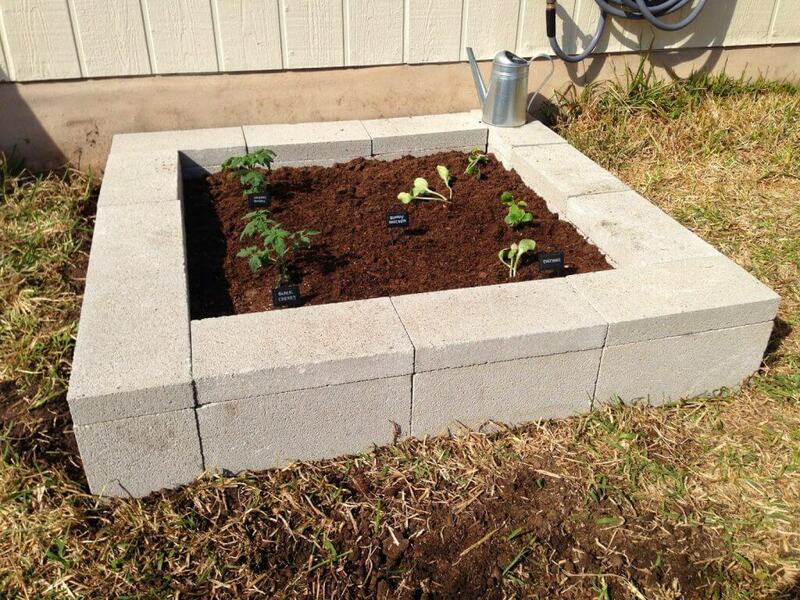 The double holes in the blocks are perfect for adding potting soil and housing your favorite flowers. Succulents are a great choice for a low maintenance approach. Leave your bench just as it is or take it up a notch by painting the blocks any color you choose. Looking for a backyard update that will stand out and make a statement? Cinder blocks come in a variety of shapes and sizes so take advantage of their versatility and durability by creating stackable structures. 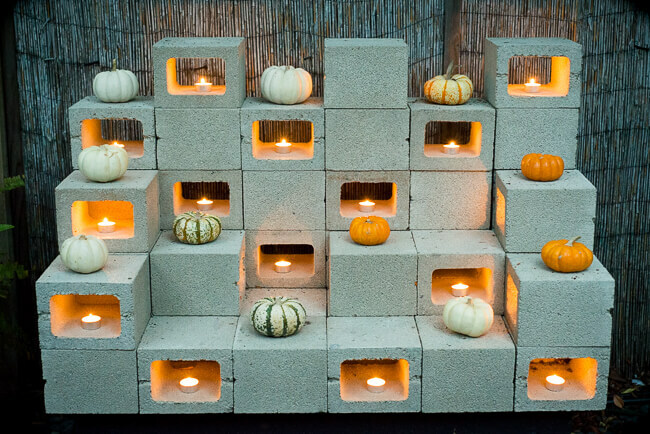 Switch your cinder block sculpture up as often as you’d like and change out the décor with every new season. 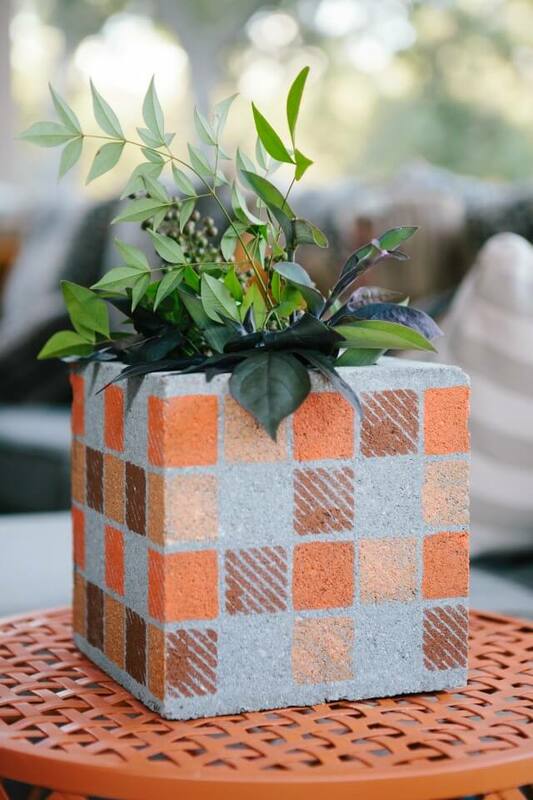 Transform a boring square cinder block into a beautiful concrete vase almost instantly. Paint the cinder block using your favorite design, quote or stencil and display it on your patio, front porch or even inside. Fill the hole with your favorite flowers for a beautiful display you can enjoy all year around. If you’ve been wanting to grow plants, fruits or vegetables in your backyard, you don’t need to break new ground. You can simply create a raised garden above ground using wood or even cinder blocks. Wood can age and deteriorate, so using cinder blocks is the perfect alternative. This raised garden bed is a great option if you don’t have a large backyard or if you simply want to enhance your home’s curb appeal. This is a project that’s so quick to create and will look absolutely stunning and stylish in your sun room or backyard patio. This functional and practical potting table can be used a variety of ways. Store all of your plants, gardening tools and equipment on the shelves or change it into a standstill bar cart to hold plates, cups and drinks during family gatherings. Take your creative style and design techniques to the next level by creating a super stylish mosaic planter using cinder blocks. 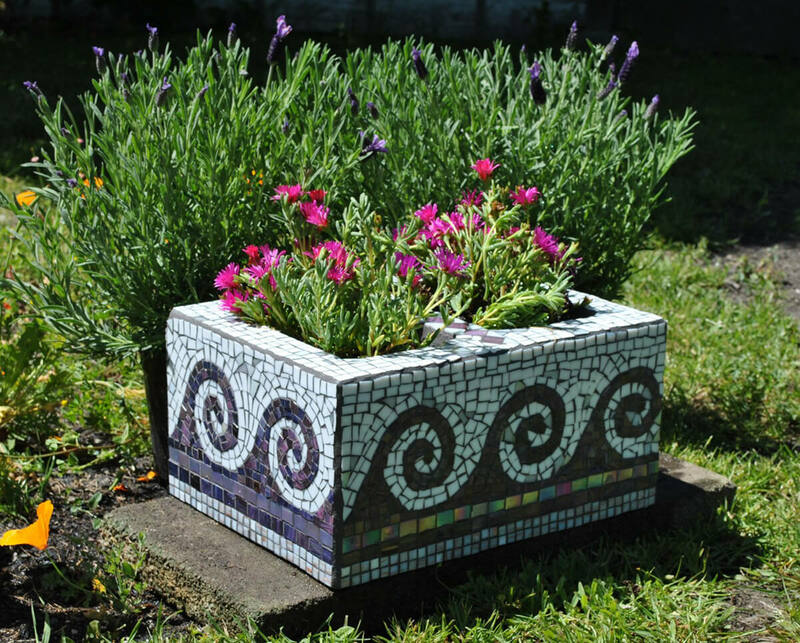 With a few broken tile pieces, you can create a masterpiece turning your garden into both an earth project and art project. Fill it with your favorite plants and you have a unique new way to showcase your artistic skills! Build your own backyard furniture with ease this summer by using cinder blocks and a few wood posts. Cinder blocks are a sturdy, durable and very affordable material to consider for your outdoor furniture. Now your guests will have plenty of room to sit outside and enjoy all of your summer soirees. Sit poolside this summer in style. 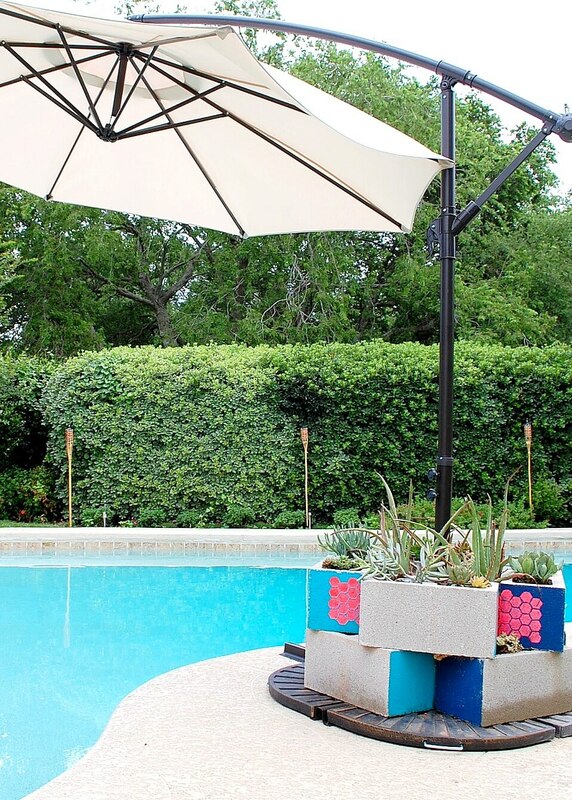 These concrete blocks are a great way to cover up the base of an outdoor umbrella. With a sleek and fun design, it is sure to be a conversational piece while sipping lemonade with your friends. Paint the blocks bright, bold colors or even add in a unique design to make it stand out. Finish off your gorgeous new focal point with flowers and plants you may already have on hand.